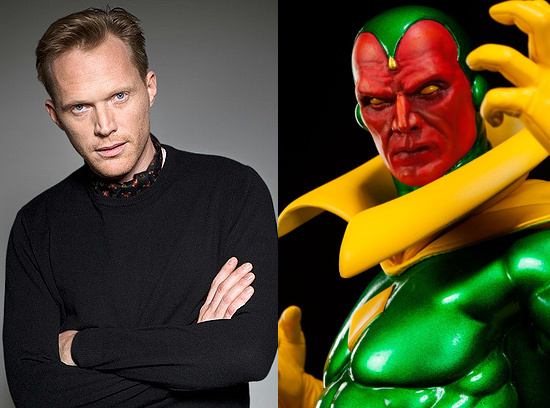 Paul Bettany, best known to Marvel fans as the voice of Tony Stark’s helpful A.I. Jarvis, has signed on to play the synthetic android known as the Vision in writer-director Joss Whedon’s upcoming superhero sequel Avengers: Age of Ultron. In the comics, the villain Ultron created the Vision to defeat The Avengers but he ultimately betrayed his programming and helped “Earth’s Mightiest Heroes” to defeat his calculating creator. The Vision has been a major part of the team since his 1968 debut in ‘The Avengers’ #57 comic book. The Vision possesses the ability to manipulate his density, which at its lowest allows flight and a ghostly, phasing intangibility, and at its heaviest provides superhuman strength, immovability, and a diamond-hard near invulnerability. Bettany joins the returning cast that includes Robert Downey Jr., Chris Evans, Chris Hemsworth, Mark Ruffalo, Scarlett Johansson and Samuel L. Jackson with James Spader as Ultron, Elizabeth Olsen as Scarlet Witch, Aaron Taylor-Johnson as Quicksilver and Thomas Kretschmann as Baron Strucker. In the sequel, Captain America, Iron Man, Thor, The Incredible Hulk, Hawkeye and Black Widow assemble to defeat the rogue sentient robot Ultron, dedicated to conquest and the extermination of humanity.